"Nghiên cứu mối tương quan giữa oxit nitric thải ra trong hơi thở thở ra và tình trạng dị ứng, bạch cầu ưa eosin máu, đột biến FCER2 và kiểm soát hen suyễn ở trẻ em Việt Nam"
Introduction: Fractional exhaled nitric oxide (FENO) is a biomarker of airway inflammation in asthma. The measurement of FENO is utilized to assist in the diagnosis and treatment of children with asthma, especially for those treated with inhaled corticosteroids. Objectives: The aims of this study were to evaluate the correlations between FENO and atopic status, blood eosinophil levels, FCER2 mutation, and asthma control in Vietnamese children. Subjects and methods: This was a prospective and descriptive study approved by the local Ethical Board. All children with uncontrolled asthma, seen in the National Hospital of Pediatrics (Hanoi, Vietnam), were included. Exhaled breath FENO, blood eosinophils, skin prick test, total IgE, asthma control test (ACT), and FCER2 gene polymorphism were performed at inclusion. They were followed up at 3 months to evaluate clinical status, FENO levels, and ACT. Results: Forty-two children with uncontrolled asthma with a mean age of 10±3 years (6–16 years) were included. The male/female ratio was 2.5/1. The mean FENO levels were 26±25 ppb. FENO was significantly higher in patients with a positive skin prick test for respiratory allergens (P<0.05). FENO was significantly correlated with blood eosinophil levels (r=0.5217; P=0.0004). Five of the 32 subjects (15.6%) had a mutation of FCER2 gene (rs28364072 SNP). In this group, the levels of FENO were highest (37±10 ppb; P<0.05). The levels of FENO were significantly decreased after 3 months of treatment (17±8 ppb vs 26±25 ppb; P<0.05). Significant correlations between inhaled corticosteroid doses and FENO levels occurred at 1 and 3 months (r=0.415, P=0.007; r=0.396,P=0.010; respectively). There were no correlations between FENO levels, ACT, and daily use of salbutamol. After 3 months, asthma remained uncontrolled in 22.2% of children. Conclusion: The measurement of FENO levels is a useful and feasible tool to predict clinical, biological, and asthma control in Vietnamese children. Asthma is a diverse disease with many phenotypes, characterized by chronic airway inflammation, bronchial hyperresponsiveness, and smooth muscle contraction. In addition, the severity of airway obstruction increases secondary to secretions, decreased airway pliability, and mucosal edema. The present treatment paradigm is the use of bronchodilators for symptoms and inhaled corticosteroids (ICS) to reduce and control inflammation. As recommended by Global Initiative for Asthma (GINA),1the assessment of asthma control is based on frequency of asthma symptoms, use of medication for asthma crisis and symptoms, activity inhibition, and severity of airway obstruction. However, this assessment does not directly reflect the severity of airway inflammation, the crucial key for appropriate asthma control. This study was planned to demonstrate the correlations between FENO and atopic status, blood eosinophil, FCER2 gene mutation, and the level of asthma control in Vietnamese children with uncontrolled asthma. Children with asthma and symptoms who presented to the ­Consultation Department or Department of ­Immunology, Allergy, and Rheumatology of the National Hospital of Pediatrics (Hanoi, Vietnam) from July 2014 to August 2015 were included in the present study parents/guardians signed an Institutional Review Board-approved consent forms on the patients’ behalf. Study subjects having one of the following were excluded: significant other chronic or acute disease, or severe asthma exacerbations needing systemic corticosteroid therapy (oral or injection) at inclusion. This study was a prospective and descriptive study. All subjects with uncontrolled asthma were treated at inclusion as recommended by GINA. They were followed for 3 months. This study was approved by the Ethical Review Board of the National Hospital of Pediatrics (Hanoi, Vietnam). Asthmatic children who met inclusion criteria were classified into four different levels of asthma severity for management (intermittent asthma: short-acting beta agonist [SABA] as needed; mild asthma: low dose ICS + SABA as needed; moderate asthma: moderate to high dose ICS + SABA as needed; severe asthma: moderate to high dose ICS + long-acting beta agonist + SABA as needed). ICS response and asthma control were evaluated by physicians as recommended: controlled, partially controlled, or uncontrolled asthma. Asthma control test (ACT) was used as a self-assessment by study subjects ≥12 years old or their parents (<12 years old). Usage of SABA was recorded in the diary by day and time for analyses. All data on medical and family history, clinical examination, and measures of FENO, spirometry, skin tests, blood eosinophils, and genetic polymorphism of study subjects were collected for statistical analyses. ACT was used for children over 12 years old with five scoring questions and four scoring questions for children <12 years old combined with three questions for their parents. Complete blood count with eosinophil value (%) was analyzed by automatic machines (XT-4000i-SYSMEX; Kope, Japan). IgE concentration in peripheral blood was quantified by chemical luminescence technique (COBASC 501; Hitachi, Japan). SPT (Stallergenes; London, UK): negative control was 0.9% saline solution; positive control was 1 mg/mL of histamine. Six respiratory allergens including Dermatophagoides pteronyssinus,Dermatophagoides farinae, Blomia tropicalis, and hairs and epidermis of dogs, cats, and cockroaches were tested. Percutaneous skin test was considered positive when the wheal size exceeded the negative control by 3 mm. Lung function testing (spirometry) was done by Koko (Inspire, Hertford, UK). The reversibility of forced expiratory volume in 1 second (FEV1) was evaluated after 15 minutes of using 200 µg salbutamol. The test was positive when there was an increase of FEV1 ≥12% and >200 mL. Rs28364072 polymorphism in FCER2 gene was genotyped at the Laboratory for Molecular Biomedicine belonging to the School of Medicine and Pharmacy at Vietnam National University–Hanoi, using DNA extracted from peripheral blood leukocytes with a routine salting out procedure. Polymerase chain reaction method was used to amplify the alleles of the FCER2 gene, using the following forward and reverse primers: 5’-TCATAGCTCCAGCAGAGAACAC-3’ and 5’-GCCAAGACTCACCCTTCTAATCT-3’. The FCER2 gene amplified regions were then sequenced by using the BigDye®Terminator v3.1 Cycle Sequencing Kit on ABI 3500 Series Genetic Analyzer (Thermo Fisher Scientific, Waltham, MA, USA), and SNP alleles were identified by employing the BioEdit Version 7.1.9 (Abbott Laboratories, Carlbad, California, USA) for sequence alignment and analyses. Population allele and genotype frequencies were estimated based on the Hardy–Weinberg principles. SPSS 22.0 software (IBM Corporation, Armonk, NY, USA) was used to analyze these data. Qualitative variables were expressed as numbers or percentage. Quantitative variables were presented as mean ± standard deviation. Standard ­distribution was tested by the Skewness-Kurtosis technique. Regression test was used to measure the correlation between FENO and quantitative variables with the correlation coefficient r of Pearson for standard distribution variables and of Spearman for nonstandard distribution variables. 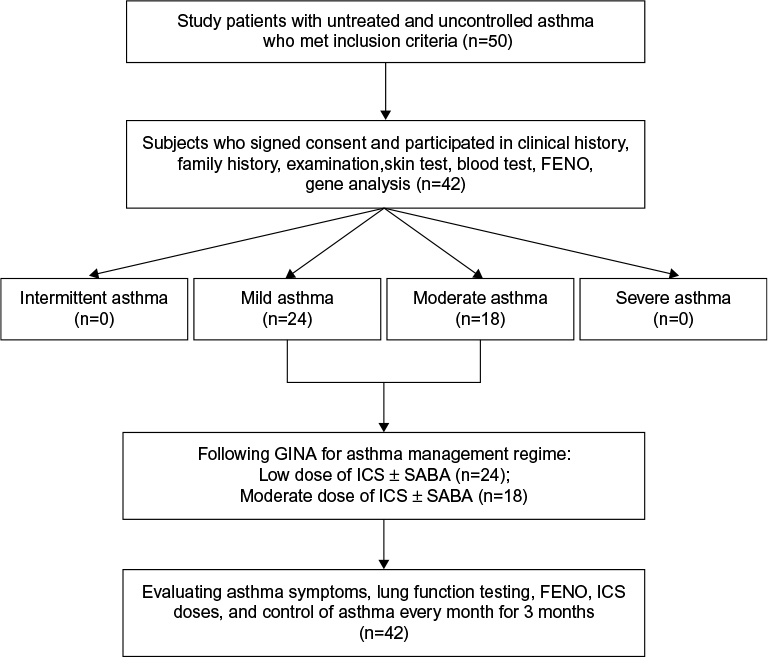 Mann–Whitney U test was used to evaluate the correlation between FENO and asthma control levels. The multiple correlations (FENO and allergens) were performed with Kruskal–­Wallis test. From July 2014 to August 2015, 42 subjects with the mean age of 10±3 years were included in the present study (Figure 1). There were 28.6% females and 71.4% males. Eighty-one percent of study subjects were atopic (Table 1) and 61.9% of study subjects had a familial history of allergy. 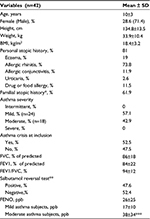 Of the subjects, 57.1% had mild asthma and 42.9% moderate asthma. The results of spirometry demonstrated that the mean FEV1 was slightly reduced compared to predicted values (84±22%;Table 1). The mean FENO was 26±25 ppb. FENO levels of subjects with moderate asthma were significantly higher than subjects with mild asthma (38±34 ppb vs 17±10 ppb; Table 1). 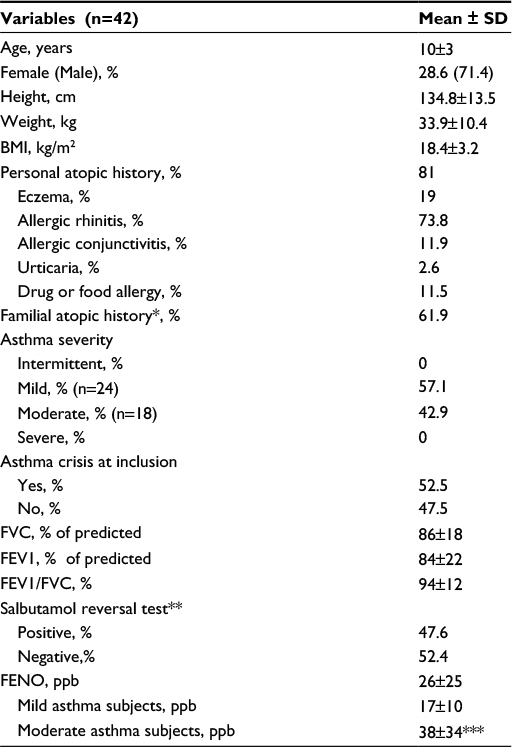 Notes: *Eczema, allergic rhinitis, allergic conjunctivitis, urticaria, drug or food allergy; **gain of FEV1 ≥12%; ***significant difference vs mild asthma with P=0.0063. Abbreviations: SD, standard deviation; BMI, body mass index; FVC, forced vital capacity; FEV1, forced expiratory volume in 1 second; FENO, fractional exhaled nitric oxide. Figure 1 Study flow chart of recruitment and randomization. Abbreviations: FENO, fractional exhaled nitric oxide; GINA, Global Initiative for Asthma; ICS, inhaled corticosteroids; SABA, short-acting beta agonist. The concentrations of FENO when compared between subjects with positive SPT results and negative results are presented in Figure 2 and Table 2. 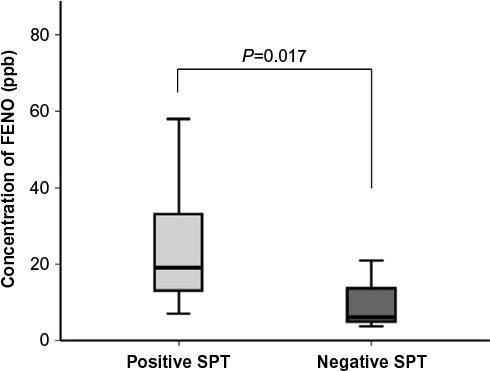 FENO in subjects with positive SPT (with at least one respiratory allergen) was significantly higher than in those with negative SPT (24±12 ppb vs 5±2 ppb; P<0.05; ­Figure 2). The concentrations of FENO were not significantly different between those sensitive to the different allergens (Table 2). Figure 2 Concentration of FENO associated with skin prick test (SPT) being positive or negative. Notes: Results are in response to a Student’s t-test. Abbreviation: FENO, fractional exhaled nitric oxide. Abbreviations: FENO; fractional exhaled nitric oxide; NS, nonsignificant difference between each allergen. 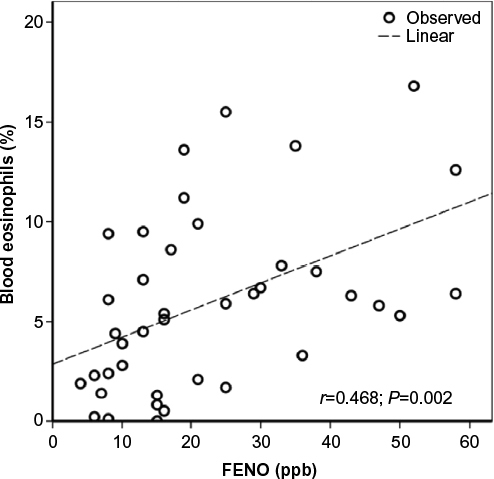 The correlation between FENO and percentage of blood eosinophils is presented in Figure 3. There was a moderate and significant correlation between the concentration of FENO and blood eosinophil percentage and absolute value (r=0.468, P=0.002; r=0.522, P=0.0004; respectively). Figure 3 Correlation between FENO levels and blood eosinophils (n=40). Notes: Results are in response to a regression analysis. The concentration of FENO associated with FCER2 gene polymorphism is presented in Table 3. The concentration of FENO in homozygous variant rs28364072 (CC) of FCER2 gene was significantly higher than homozygous wild type (TT) and heterozygous (TC) (37±10 ppb vs 22±15 ppb and 19±7 ppb; P<0.05 and P<0.05; ­respectively; Table 3). Note: *Significant difference vs TT and TC. Abbreviations: FENO; fractional exhaled nitric oxide; NS, nonsignificant difference between TT and TC. The correlations between FENO and ACT, ICS doses, and daily use of SABA are presented in Table 4. There were no significant correlations between FENO and ACT and daily use of SABA puffs (Table 4). There was a moderate and significant correlation between FENO and ICS doses at first day of inclusion and after 1–3 months (r=0.396 – 0.428; P=0.005–0.010; Table 4). Abbreviations: FENO; fractional exhaled nitric oxide; ACT, asthma control test; ICS, inhaled corticosteroids; SABA, short-acting beta agonist. The variation of FENO concentration at inclusion, 1 month, and 3 months into therapy is presented in Figure 4. There was no significant difference between FENO concentration at inclusion and after 1 month of treatment (26±25 ppb vs 19±16 ppb; P=0.261; Figure 4). There was a significant difference of FENO concentration at ­inclusion and 3 months into therapy (26±25 ppb vs 17±8 ppb;P=0.034; Figure 4). Figure 4 Variation between FENO concentrations from inclusion and after 1 and 3 months of therapy. The results of our study showed that 1) the levels of FENO in children with uncontrolled asthma were significantly higher than normal values; 2) FENO levels were significantly higher in subjects with moderate asthma, positive SPT, and FCER2 gene mutation; 3) there were significant correlations between FENO levels and blood eosinophil counts and ICS doses; and 4) there were significant decreases of FENO levels after 3 months of treatment with ICS. Analyses of FCER2 gene polymorphism showed that 15.6% (5/32) of children with asthma in our study had the homozygous variant (CC) of rs28364072 (Table 3). Interestingly, the levels of FENO in asthma subjects with rs28364072 homozygous variant (CC) were significantly higher than homozygous wild type (TT) and heterozygous (TC) variant (37±10 ppb vs 22±15 ppb and 19±7;P<0.05 and P<0.05; respectively; Table 3). A previous study demonstrated that the minor allele of T2206C (rs28364072) in FCER2 was significantly associated with poor lung function response in asthmatic patients.17 The multivariable association of the FCER2 SNPs with IgE levels has shown that variants in T2206C (rs28364072) were significantly associated with increases in IgE levels at 4 year, and also increased the risk of severe exacerbations in patients using ICS,18,19 but not in subjects with asthma control on ICS.18 The T2206C (rs28364072) variants were also associated with increased daily ICS doses.19 However, the correlation between FCER2 gene polymorphism and the level of FENO in exhaled breath has not been well demonstrated. The results of our study showed that FENO levels in asthmatic children with rs28364072 homozygous variant were significantly higher than in other variants (Table 3). In the present study, due to the small number of asthma subjects with FCER2 gene ­mutation (n=5) and also the small sample size (n=42), we could not define a specific FENO level that correlated with FCER2 gene mutation. Nonetheless our data suggest that high levels of FENO might predict a risk of having an FCER2 gene mutation. Obviously more studies should be done to confirm our suspicion. Actually, many studies have attempted to associate gene expression with drug response in asthma. Particularly, FCER2 gene coding for low affinity IgE receptor has been investigated for associations with ICS response and asthma severity. Tantisira et al18 showed that the SPN – rs28364072 was related to the use of albuterol and also increased the number of exacerbations in asthmatics treated with ICS. In the present study, among 42 asthmatic children, 32 subjects had FCER2 sequencing and five subjects had a mutation (Table 3). These five children were well controlled with ICS after 3 months of treatment and had significantly decreased FENO levels (25±3 ppb at 3 months and 14±3 ppb at 1 month vs 40±7 ppb at inclusion; data not presented in the results). The level of FENO is a feasible biomarker to predict clinical and biological status of children with asthma. High levels of FENO are helpful for screening asthma subjects for the possibility of the FCER2 gene mutation and ICS response. Decreasing level of FENO is a good indicator for asthma control. Therefore, measuring FENO is a very useful tool in the management of patients with asthma, especially in developing countries, such as in Vietnam. The authors would like to thank the Vietnamese National University–Hanoi; Project QG.14.59 for the grant that contributed to gene analyses. Global Initiative for Asthma (GINA) 2014. Available from: http://ginasthma.org/archived-reports/. Alving K, Weitzberg E, Lundberg JM. Increase amount of nitric oxide in exhaled air of asthmatics. Eur Respir J.1993;6(9):1368–1370. Strunk RC, Szefler SJ, Phillips BR, et al. Relationship of exhaled nitric oxide to clinical and inflammatory marker of persistent asthma in children. J Allergy Clin Immunol. 2003;112(5):883–892. Payne DN, Adcock IM, Wilson NM, Oates T, Scallan M, Bush A. Relationship between exhaled nitric oxide and mucosal eosinophilic inflammation in children with difficult asthma, after treatment with oral prednisolone. Am J Respir Crit Care Med. 2001;164(8 Pt 1):1376–1381. Dweik RA, Boggs PB, Erzurum SC, et al. An official ATS clinical practice guideline: interpretation of exhaled nitric oxide levels (FENO) for clinical applications. Am J Respir Crit Care Med. 2011;184(5):602–615. Pearce N, Pekianen J, Beasley R. How much asthma is really attributable to atopy? Thorax. 1999;54(3):268–272. Douwes J, Gibson Pekianen P, Pearce N. Non-eosinophilic asthma: importance and possible mechanisms.Thorax. 2002;57(7):643–648. Sy DQ, Thanh Binh MH, Quoc NT, et al. Prevalence of asthma and asthma-like symptoms in Dalat Highlands, Vietnam. Singapore Med J. 2007;48(4):294–303. Just J, Gouvis-Echraghi R, Rouve S, Wanin S, Moreau D, Annesi-Maesano I. Two novel, severe asthma phenotypes identified during childhood using a clustering approach. Eur Respir J. 2012;40(1):55–60. Mahut B, Trinquart L, Le Bourgeois M, et al. Multicentre trial evaluating alveolar NO fraction as a marker of asthma control and severity. Allergy. 2010;65(5):636–644. Jatakanon A, Lim S, Kharitonov SA, Chung KF, Barnes PJ. 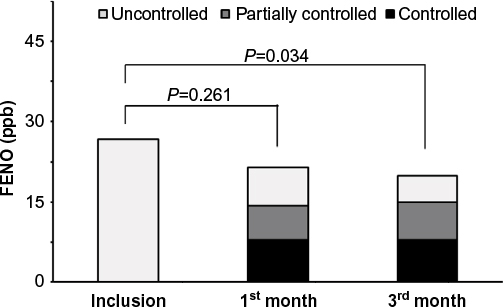 Correlation between exhaled nitric oxide, sputum eosinophils, and methacholine responsiveness in patients with mild asthma. Thorax. 1998;53(2):91–95. Warke TJ, Fitch PS, Brown V, et al. Exhaled nitric oxide correlates with airway eosinophils in childhood asthma.Thorax. 2002;57(5):383–387. Haldar P, Brightling CE, Hargadon B, et al. Mepolizumab and exacerbations of refractory eosinophilic asthma. N Engl J Med. 2009;360(10):973–984. Chibana K, Trudeau JB, Mustovich AT, et al. IL-13 induced increases in nitrite levels are primarily driven by increases in inducible nitric oxide synthase as compared with effects on arginases in human primary bronchial epithelial cells. Clin Exp Allergy. 2008;38(6):936–946. Smith AD, Cowan JO, Filsell S, et al. Diagnosing asthma: comparisons between exhaled nitric oxide measurements and conventional tests. Am J Respir Crit Care Med. 2004;169(4):473–478. Woodruff PG, Modrek B, Choy DF, et al. T-helper type 2-driven inflammation defines major subphenotypes of asthma. Am J Respir Crit Care Med. 2009;180(5):388–395. Rogers AJ, Tantisira KG, Fuhlbrigge AL, et al. Predictors of poor response during asthma therapy differ with definition of outcome. Pharmacogenomics. 2009;10(8):1231–1242. Tantisira KG, Silverman ES, Mariani TJ, et al. FCER2: a pharmacogenetic basis for severe exacerbations in children with asthma. J Allergy Clin Immunol. 2007;120(6):1285–1291. Koster ES, Maitland-van der Zee AH, Tavendale R, et al. FCER2 T2206C variant associated with chronic symptoms and exacerbations in steroid-treated asthmatic children. Allergy. 2011;66(12):1546–1552. Smith AD, Cowan JO, Brassett KP, Herbison GP, Taylor DR. Use of exhaled nitric oxide measurements to guide treatment in chronic asthma. N Engl J Med. 2005;352(21):2163–2173. Duong-Quy S, Hua-Huy T, Doan-Quynh N, et al. A study of exhaled NO (FENO) measurement used to determine asthma control, dose of inhaled corticosteroid and cost in a developing country. Eur Respir J. 2015;46(Suppl 59):5013. Duong-Quy S, Hua-Huy T, Tran-Mai-Thi HT, Le-Dong NN, Craig TJ, Dinh-Xuan AT. Study of Exhaled Nitric Oxide in Subjects with Suspected Obstructive Sleep Apnea: A Pilot Study in Vietnam. Pulm Med. 2016;2016:3050918.